How to start your food peddling business? 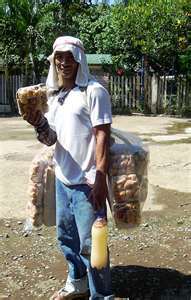 Angie, a viand vendor, sells her home-made viand to various offices. She chose the offices to sell her prepared dishes because employees have money to buy. With her big basket full of food packed in cellophane, she sells it to numerous government offices. She starts to vend as early as 9:00 in the morning and finishes it as early as 11 o’clock in the morning. “Some of the employees have not eaten their breakfast before leaving their homes that’s why I come early.” Angie prepares at least seven types of dishes—eggplant omelet, sunny side-up egg, fried fish, fish cooked in vinegar, chicken adobo and many more. If you know who are your market, it is easy for you to plan what dishes to prepare. However, you have to decide on what food to offer for your customers. Like Angie, she decided to focus her business on breakfast and lunch dishes. She later found out that some of her customers love to eat vegetables, she then cooked Filipino food vegetable recipes like adobong kangkong (Swamp cabbage cooked in vinegar and soy sauce), Ginataang Gabi na may Hipon (Taro Cooked in Creamy Coconut Milk with Shrimp) and others. Angie sometimes asked her customers what dishes they preferred to eat the next day, a strategy which could save any vendors of thinking what dish to prepare the following day. Meanwhile, this is a good sign that you have created your set of loyal customers. It is better that you find a perfect partner for your small business. Inside your local market, find a partner who could provide you with your needs like spices, vegetables, chicken meat and pork and many others. Established rapport with them because sometimes they agree to get a product payable after a week. What makes Angie’s viand ahead of any vendors is its affordability. She sells her dishes at lower price compared to other food peddlers but she does not compromise its clean preparation and good taste because after all these make her customers come back for more. This is important. Since Angie is selling her dishes inside a government institution, she requires herself to dress neatly. Before she sells she sees to it that her dress is neat and tidy. The business is alive with food peddling, this is the reason that many small time entrepreneurs choose to engage in this kind of business. Tiring, yes, but money is flowing everyday. Make this in its fullest potential.